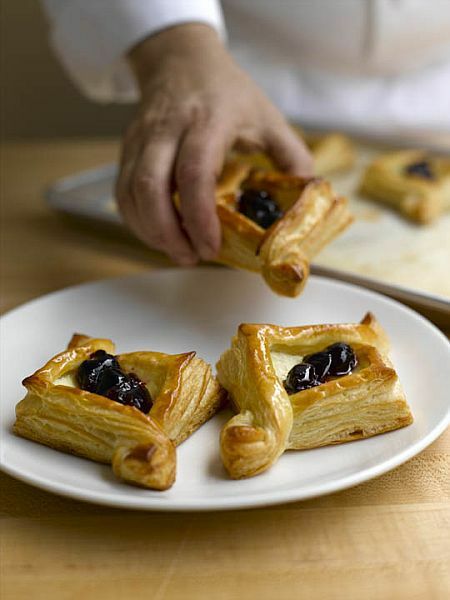 This recipe for cherry cheese baskets is made with easy puff pastry and is a perfect brunch or breakfast pastry. This would fall into the Viennoiserie (French for "Viennese specialties") category of baking, along with croissants, brioche, pain au chocolat, Danish, and others. These treats can be found on the breakfast buffets at finer hotels and in bakeries in Eastern Europe. On a lightly floured surface or marble, roll dough into a 20x16-inch rectangle. Using a sharp pastry wheel or knife, cut dough into 20 (4-inch) squares. Place squares on parchment-lined baking sheet and refrigerate until firm, about 10 minutes. In a medium bowl, cream together cream cheese, sugar, cornstarch, lemon and orange zest, and vanilla until very smooth and light. Any leftover filling can be refrigerated in a covered container for up to 2 days. Fold 4-inch squares of dough in half to make a triangle. Position the triangle so the closed point of the triangle is away from you. Use a sharp knife to make a cut parallel to the two shorter sides of the triangle. These cuts should come within 1/4 inch of the point but should not cut entirely through the point. These two cuts make the rim for the basket. Open out the triangle and brush very lightly with egg wash. Fold one basket rim over to line up with the opposite side. Repeat with the second rim. Add 1 tablespoon of the cheese filling to each basket. Transfer to the baking sheet and chill for several minutes while you heat the oven to 425 degrees. Bake baskets until golden brown, about 20 minutes. Transfer to cooling racks and brush with warm apricot glaze while still hot. In a saucepan, combine jam, water, corn syrup, and brandy. Bring to a boil over high heat, stirring until jam is completely melted. Strain through a wire-mesh sieve into a bowl. Use while still warm. Cool leftovers and refrigerate in a covered container for up to 3 weeks. In a small bowl, combine cornstarch with 1/4 cup cherry juice or water, stirring until cornstarch is completely dissolved. In a medium saucepan, combine remaining cherry juice or water, sugar, lemon juice, cinnamon, nutmeg, and salt. Bring to a boil over high heat, stirring until sugar is dissolved. Add cornstarch mixture and return to a boil, stirring constantly, until thickened and smooth, about 3 minutes. Add cherries and simmer until cherries are very tender, 5-6 minutes. Add more sugar if necessary. Remove filling from heat and stir in butter until it melts. Transfer to a bowl set in an ice bath and cool, stirring occasionally. Once the filling has reached room temperature, it is ready to use or store in a covered container in the refrigerator for up to 10 days. Spoon 1 tablespoon cherry filling into each basket. Cool baskets completely before serving.